The Wonder of Christ's Love! You may be familiar with the “7 Wonders of the World.” This is a term that was developed to identify remarkable creations on earth. Seven was chosen by the Greeks because the number was associated with perfection. What you may not know is that of the 7 original wonders of the ancient world, only one still exists - the Great Pyramid of Giza. A more modern comparison may be Guinness World Records, whose mission is “to make the amazing official.” After doing a quick search, I was glad to prove my sister wrong and that in fact, I don't have the biggest nose in the world. But records are made to be broken. And as we've learned from history, earthly wonders don't last forever. As Christians, we know of a wonder that is far greater than anything Guinness has witnessed; it was something that took place over 2,000 years ago when Jesus Christ was revealed to the Gentiles as the Son of God, Kings of kings, Light of the world. finally met Jesus. After traveling so far, over such a long period of time, they witnessed the greatest wonder the world would ever know, the revelation of Jesus as God made man. In that moment, they bow down to the King of kings and Lord of lords. They see the light of the world and have come to worship Him. Just like those wise men, we are still moved to worship Him today. It is through our worship that we draw close to God, hear His Word, receive His gifts, and the Holy Spirit works in our hearts. This is why Worship Anew is so vital in the sharing of Christ's love in our world now, and why I ask you to support the work of this ministry today. Yes, your gift to Worship Anew takes the message of Salvation to so many who are facing life's most difficult circumstances. Thousands every week are coming together all over the world to hear the message of salvation through Christ on Worship Anew. As we journey through this Epiphany season, may you be ever mindful that of all the wonders of this world, there is one that is greater than all the rest, and His wonders will be with us for all eternity. Matthew Leighty is Executive Director of Lutheran Ministries Media. 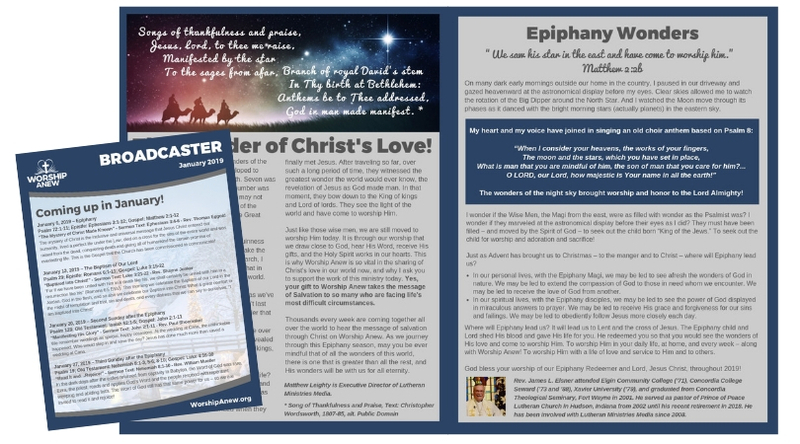 Click “View/Download” to read the full January 2019 Broadcaster including what's coming up on Worship Anew.